Thursday marks the end of the January transfer window where football clubs can no longer buy players until July. Transfer deadline day prompts a frenzy of last-minute activity - and you will be able to keep up to date with all the ins and outs across the BBC. We will bring you extensive coverage of all the transfers across television, radio, online, the Red Button and via social media. From 07:00 GMT the BBC Sport website will feature a full live transfer deadline day text commentary, running through until midnight. This live, rolling news service will include the latest rumours, breaking stories, pictures and confirmed deals from the BBC's team of reporters and correspondents in television, radio and online across the UK and Europe. We'll also use the @BBCSport account on Twitter to break news of all the latest transfer developments throughout Thursday. Download the new BBC Sport app to help you stay on top of the latest days while you are out and about. Between 13:00-18:00 GMT on the Red Button and online, Football Focus presenter Dan Walker will give hourly updates with football experts and journalists as they react to the latest transfer news. You can tune into the BBC News Channel throughout the day for the latest sports news bulletins and at 18:30 GMT Dan Walker will host a Transfer Deadline Football Focus Special to examine the day's biggest moves. There will also be a 30-minute Football Focus transfer deadline show with Robbie Savage and Dan Walker on BBC2 at 23:20 GMT which will round up all the day's deals. On Saturday, Football Focus will include with a transfer round-up and discussion about which clubs have emerged as the winners from the winter transfer window. Tune in at 12:15 GMT on BBC One. Radio 5 live will update listeners with all the breaking transfer deadline day activity throughout the day, including half-hourly sports bulletins. Mark Chapman hosts an extended 5 live Sport from 19:00 GMT on Thursday, and will be joined by David Pleat, Owen Coyle, Robbie Savage and Ian Dennis to bring you the latest news of the breaking transfer stories are they happen during the final few hours of the window. 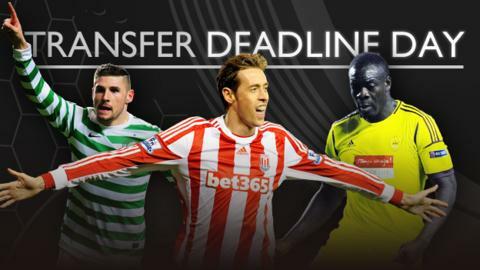 You won't miss a single bit of action on transfer deadline day with the BBC.